It was a special weekend for Japanese sports fans who witnessed an impressive double triumph on home soil Sunday. Kamui Kobayashi finished third in the Japanese Grand Prix and Kei Nishikori became the first Japanese tennis player to win the Japan open in the tournament’s 41 year- history. A first ever place on the podium and it came in front of Kobayashi’s home fans – Japanese sports fans almost exploded with delight. At The Diplomat we have talked before of the growing Asian presence in Formula One. Until now most of the impact has been limited to staging races but things are changing on the track. Kobayashi finished in third at the Suzuka circuit on Sunday to cap off a solid race. He started in third place on the grid. “Finally, we finish in the points and on the podium, and that’s fantastic, especially in front of my home grand prix,” Kobayashi said. The driver waved to the thousands of fans gathered chanting his name as he took the podium. Experienced Formula One journalists tweeted the delight of the Japanese journalists in the media center as Kobayashi crossed the finishing line ahead of Jenson Button. "This is my first podium and it's amazing. I am happy for the fans and so many people supporting me. When you look around circuit, it is amazing. So thank you to the fans and we need to keep going for the future." Kobayashi becomes only the third Japanese driver to take the podium. Takuma Sato managed the same position at the 2004 United States Grand Prix, the last occasion it happened. It is also the first top three finish in Suzuka for over 20 years. It was good timing from the 26 year-old. His future next season with the Sauber team has been in doubt but the podium finish is a welcome reminder to his bosses as to just what he is capable of. "I don't think I [will] lose my job," he told BBC Sport. "I was a couple of times close to the podium [this year] but always had some bad luck. First time I get it, it's here. Maybe it was destiny." If that was a delight for Japanese fans then there was more as Kei Nishikori defeated young Canadian star Milos Raonic in the final of the Japan Open 7-6, 3-6, 6-0 in something of a surprise result. 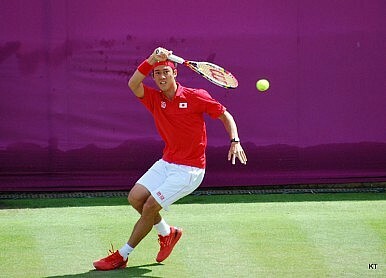 "I can't believe it," said Nishikori. "I've never played well in this tournament before, so I had thought I would never win this tournament. I'm really happy to win." "To have won this tournament in Japan is a very happy occasion for me."